xHosting Review 2019: Is xHosting a Good Hosting? xHosting is an Israeli web hosting company offering shared, reseller, and VPS hosting on Israel-based servers. SSD storage and unlimited traffic with all plans are attractive offers for smaller webmasters looking for a deal on advanced features. 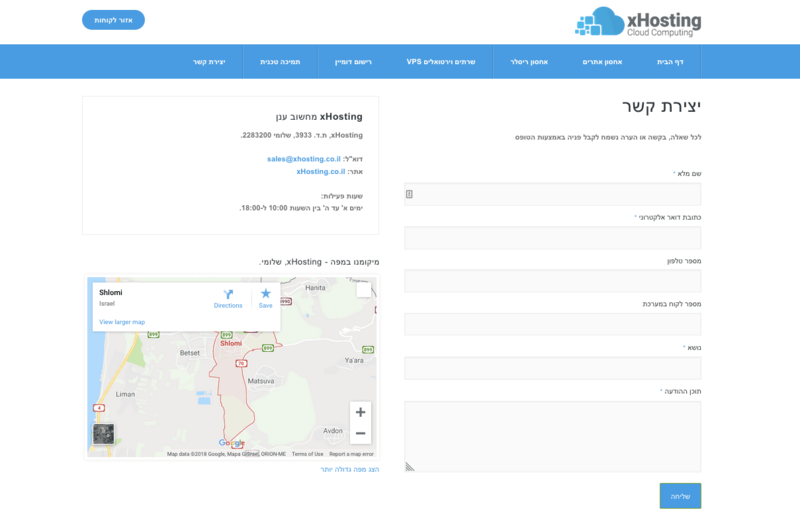 xHosting is an Israeli web hosting company with years of experience offering Linux-based website hosting as well as managed and unmanaged VPS hosting via servers in Israel. Support is Hebrew language only. xHosting markets itself as a secure and reliable web hosting solution. All plans come with a 99.95% availability guarantee and free daily backups retained for seven days. However, there’s no free domain registration included and SSL certificates must be purchased elsewhere. There are only a few dozen integrations offered, which is a minus considering most other hosts would provide a couple hundred. However, that includes one-click integrations of the popular WordPress and Joomla CMSes, so most beginners will find the selection somewhat satisfactory. The infrastructure behind xHosting’s VPS plans is continually upgraded to provide high-traffic websites, e-commerce merchants, and advanced webmasters with the most advanced cloud computing technology. Unfortunately, there’s no information about full root access, network port speeds, PHP versions, or the type of virtualization, so you may want to check on these aspects with customer support beforehand. In addition, xHosting’s highest-level VPS plan only comes with two CPU cores, which could negatively impact speeds for complex websites. There are four different shared hosting plans available with the same set of features. The only difference between these is the amount of storage space, which ranges from 500MB to 5GB. This pricing scheme has the dual effect of increasing the value of the lower-tier plans relative to competitors, while also decreasing the value of the higher-tier plans. An individual webmaster running a website with lower memory requirements can get a speed boost from SSD and unlimited MySQL databases — features that don’t always come with low-tier pricing. But webmasters running high-traffic blogs and e-commerce websites can find higher-tier plans elsewhere that offer this functionality without a 5GB storage cap. There are also four different VPS hosting plans that all offer the same feature set but offer storage space ranging from 15GB to 100GB and RAM ranging from 512MB to 6GB. Unfortunately, the price-to-value ratio moving between the lower-tier plans is poor. Moving up one tier to the “Gold” plan from the entry-level “Silver” plan costs 2.5x more but only offers a twofold increase in capacity. The silver lining is that moving through the higher-tier “Platinum” and “Titanium” plans offers the opposite, with a twofold increase in capacity available for just a 50% increase in price. However, it’s worth remembering that the Titanium plan only comes with two CPU cores — much fewer than what you’ll find elsewhere for similar prices. None of xHosting’s plans come with a money back guarantee. Support options are in Hebrew and could be better. xHosting’s only option is an online contact form that claims a 24-hour response time but took longer when I contacted them over the weekend. No phone, live chat, or self-help support are available. xHosting offers one-click WordPress/Joomla integrations, SSD storage, and unlimited MySQL databases. Beginner webmasters will appreciate the functionality at a low price point for shared hosting. Wondering how xHosting stacks up against other Web Hosting companies? Enter any other Web Hosting company and we will give you a side-by-side comparison.